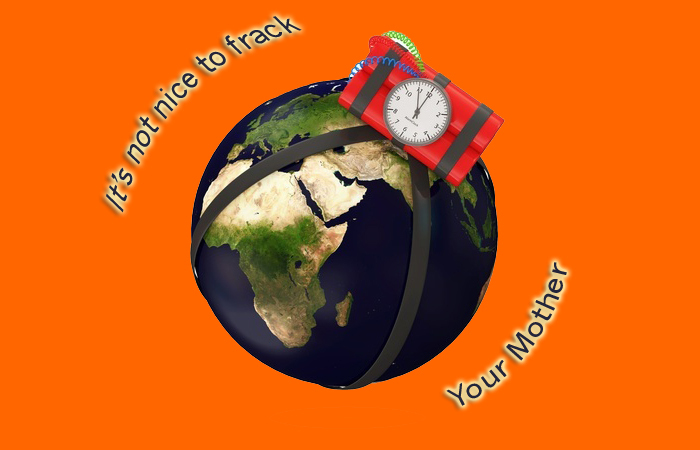 It’s not a good idea to frack your mother. Unpleasant consequences could follow. Yesterday a dear reader reminded me that not everyone is on Twitter and Facebook, which is where I put a lot of the fracking news these days. Here is a compilation of the latest fracking news so those not on Twitter and Facebook will know how we are fracking our mother. Industry, their PR guys and the SMU scientists HATE it when we use the term frackquake. I can remember how they HATEd when we used the term fracking. But we were persistent, we put a k in fracking and it stuck. Now they, too, say fracking and they even spell it with a k.
Industry and their PR guys say it’s not fracking but the disposal of the waste from fracking that causes the earthquakes. Gun nuts say it’s not the guns that kill people, it’s the bullets. Ahm, frackquakes! This evening there was a M4.0 frackquake in Venus and Mansfield. Event Page . That follows the SMU seicntist’s statement Monday at the frackquake hearing that frackquakes in this area are trending up in magnitude. It’s a 4-hour hearing but well worth the time, especially to see how Phil King is disrespectful toward his constituents. But they keep reelecting him so I guess they like it. M4.0 is the magic number at which even the naysayers admit that structural damage can occur. Don’t eat fish with tumors. A smallmouth bass was caught in the Susquehanna River in Pennsylvania that had a huge cancerous tumor on its mouth. See a video on CNN. What else has been in the Susquehanna River? Drilling waste that XTO Energy a subsidiary of Exxon Mobil spilled there. Fish with abnormal black splotches. Denmark learned this the hard way and the frackers may not get to resume fracking there. The United States can’t seem to figure it out. Our bi-monthly oil train explosion & other explosions. 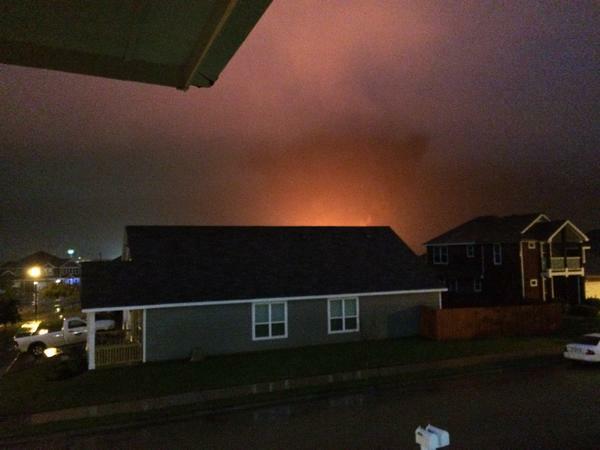 Oil & gas well tanks explode from lightning too. 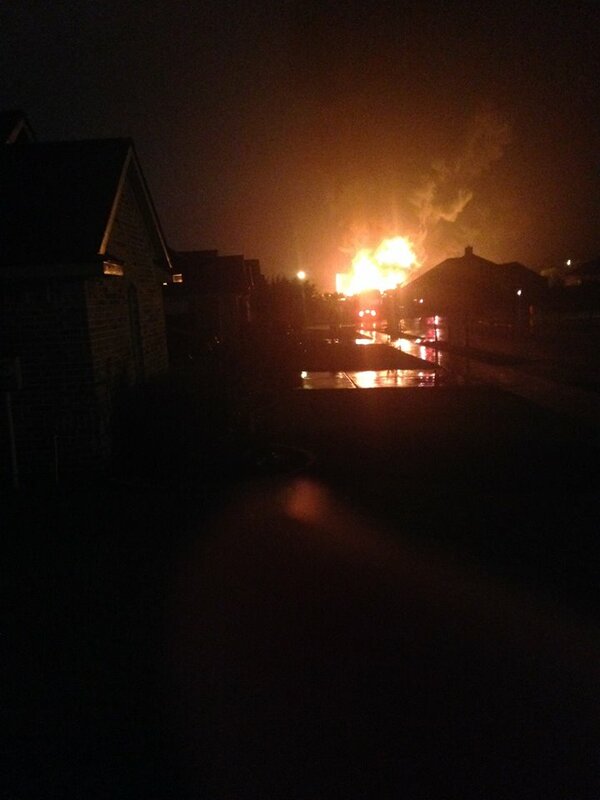 A Denton gas wells exploded tonight when struck with lightning. Photo from resident that was uploaded to DFW Scanner. From the location, it could be one of Range Resources’ wells at/near the airport. I have lots of blog posts about lightning striking wells. Updates on the lightning strike HERE. 21 million gallons of oil field wastewater is sold DAILY to farmers to irrigate food crops in Kern County California. I took a FLIR video of wastewater pits when I was in Kern County. I had to wear a respirator. This is what they are putting on our food. Sharon Wilson – Ft. Worth, Texas from Oceans 8 Films on Vimeo. It may even be lower than that. “One of Canada’s foremost experts on earthquake hazards recently told an audience of Calgary engineers that earthquakes triggered by hydraulic fracturing can exceed ‘what the natural hazard was in the first place’ and pose risks to infrastructure only built to withstand natural earthquake hazards. … Atkinson made her presentation to the Canadian Society of Exploration Geophysicists in downtown Calgary on Jan. 29. A 2012 publication of the organization recognized three years ago that hydraulic fracturing can activate faults and cause significant felt earthquakes with powerful ground motions. Of course it’s lower. People in frackquake zones have plenty of damage to their homes. But 4.0 is the magic number at which the fracking mafia can no longer ignore and deny. I agree Sharon, but according to Texas experts, it would appear some folks might just be more “sensitive.” And others might just be oblivious, or maybe they’re at the mall, so probably won’t be “bothered” by the big, big ones. I wonder who’s going to decide who gets what magnitude, and the damages that go with it? I hope whoever it is will face criminal charges and a conviction, for putting people’s lives at risk. Regulations should account for population and development. An M4.5 in an urban area could cause serious damage; An M6.0 in some rural areas bothers almost no one. In some regions people aren’t bothered much by quakes; In other regions people are very sensitive about them. Silver bullet = A simple result about injection-induced earthquakes that would make it straightforward to manage injection and avoid hazard. Hey now, that’s enough of that talk! If it weren’t for you (and a few other people I know) industry wouldn’t have such a big, greasy PR department. You’re a job creator you are! On another note, the Alberta petro-government (for the 1 percent) of 44+ years, is no more! Decimated! You would have loved it, “silver bullets” flying everywhere. Never thought I’d see it in my lifetime, and if it can happen here, it can happen anywhere!